Named for the Tibbetts family who purchased the Inn in the mid 1800s and lived in it as their home. Their son Henry Tibbetts had the building completely renovated and opened it as the Elmwood Inn in 1890. People came from miles around to enjoy Mr. Tibbetts' hospitality. The daily register was always filled and people returned year after year. This first floor room overlooking the rear garden and patio has a king bed and working fireplace. Original features like a beehive oven, exposed beams and honey colored wide pine floorboards give this room plenty of Colonial charm. 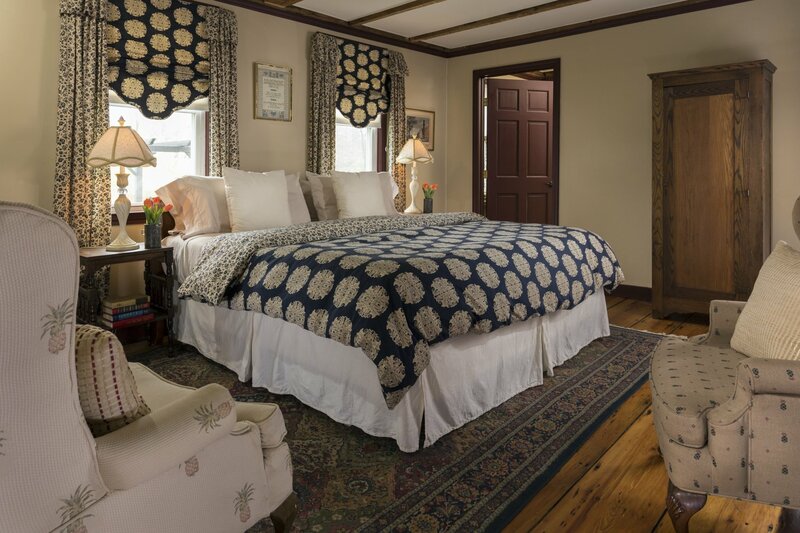 Custom drapery and coordinating bedding finish out this lovely room. Private bath with tile floor. Sleeps two.